The United Arab Emirates (UAE) is a federation of seven emirates (Abu Dhabi, Ajman, Dubai, Fujairah, Ras al-Khaimah, Sharjah, and Umm al-Quwain) in the Southeast of the Arabian Peninsula on the shores on the Persian Gulf. It borders Oman Saudi Arabia, and also contains an Omani enclave, completely surrounded by Emirati territory, Wadi Madha. As of 2010 census, the population of the United Arab Emirates was 6,888,888. 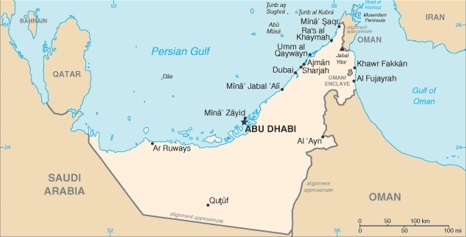 The capital of the UAE, is its second largest city, Abu Dhabi, which in 2009 had a population of 896,751. The largest city in the UAE is Dubai, which as of 2008, had a population of 2,262,000. Insight Guide Oman and the UAE is an essential guide to two jewels of the Middle East, brought to life with hundreds of evocative photographs. Our inspirational Best of Oman and the UAE section highlights the countries' unmissable sights and experiences, while a comprehensive Travel Tips section gives you all the practical information you need to plan your trip, and our selective listings bring you the best restaurants and activities on offer. Lavish magazine-style features offer a unique insight into contemporary life in Oman and the UAE, from religion to sports to expatriate communities. A detailed Places section, with full-color maps cross-referenced to the lively narrative written by our local author, guides you around the two countries, from the skyscrapers of Dubai to the remote wilderness of Oman's Empty Quarter. Stunning, specially-commissioned photography that brings these enchanting countries and their people to life. Highlights of the countries' top attractions, including awe-inspiring architecture, bustling souqs, remote wadis, and monumental forts in our Best of Oman and the UAE. Descriptive region-by-region accounts cover the whole of both countries from ultra-modern cities to time-warped mudbrick mountain villages. The little book that packs a big punch, the UAE Mini Visitors' Guide may fit in your pocket but it is also bursting with information. With an excellent pull-out map to aid exploring, a comprehensive shopping chapter and restaurant and bar reviews, this is an indispensable guide to an inspirational country. Lonely Planet’s Pocket Dubai is your passport to the most relevant, up-to-date advice on what to see and skip, and what hidden discoveries await you. Crane your neck at the world’s tallest building, the Burj Khalifa; marvel at the mythical old Arabian architecture of Madinat Jumeirah; and get some retail therapy in the charmingly chaotic warren of gold souqs or giant shopping malls. All with your trusted travel companion. Get to the heart of Dubai and begin your journey now! The Perfect Choice: Lonely Planet’s Pocket Dubai is our colourful, easy to use, handy guide that literally fits in your pocket, providing on-the-go assistance for those seeking the best sights and experiences on a short visit or weekend away. Looking for more extensive coverage? Check out Lonely Planet’s Oman, UAE & the Arabian Peninsula guide for an in-depth look at all the region has to offer.